The IARC houses an outstanding collection of Native American art, including pottery, jewelry, textiles and clothing, paintings, basketry, and drums. Containing more than 12,000 pieces, the IARC is home to works by Lucy Lewis, Maria Martinez, Mateo Romero, Lonnie Vigil, and many other renowned artists. Tours give visitors an up-close look and unique view of one of the world’s finest art collections. Private tours may be arranged for groups of eight people or more at a cost of $20 per person. Please contact IARC at least two weeks in advance of your preferred tour date. SAR Campus, “El Delirio”, the Administration Building. Explore the fascinating history, stunning architecture, and beautiful outdoor gardens—including the famous pet cemetery—of the 1920s home of Amelia Elizabeth White and Martha Root White. 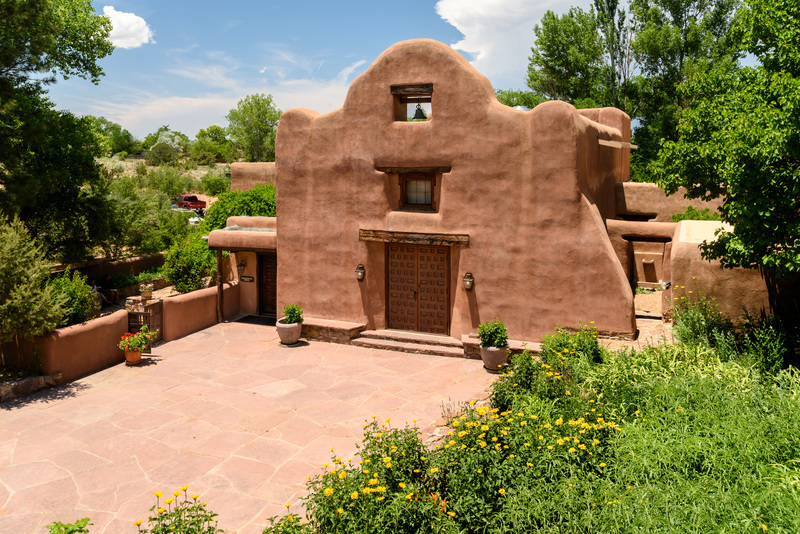 This secluded 8-acre estate, formerly known as “El Delirio” (The Madness), is the campus for SAR, a research center for anthropologists and archaeologists. Please wear comfortable walking shoes so you can fully appreciate the rustic beauty of the campus and its graveled and flagstoned walkways. Tours may be subject to cancellation or rescheduling in case of inclement weather. Private tours may be arranged for groups of eight people or more at a cost of $20 per person. Please contact the Reception Center at least two weeks in advance of your preferred tour date. Download the SAR Walking History Tour Map (PDF, 2 MB). The SAR encourages research visits at the Indian Arts Research Center by students and scholars. SAR requires that potential researchers submit a research request a minimum of two weeks in advance. All requests must go through an approval process and is subject to staff availability. Researchers are also encouraged to use the McElvain Library and Archives. It is advisable to make an appointment in advance to ensure that staff can accommodate research visits. For all research visits, please contact the division of interest directly. The SAR encourages Native artists and individuals to visit the Indian Arts Research Center and its collection. Every effort will be made to accommodate each request but advanced notice is required to ensure staff availability and space. In addition, the SAR has several programs geared toward Native audiences of all ages. For more information click here. For further information about visiting SAR, or to make reservations for the tours, please contact (505) 954-7205 or info@sarsf.org. Download the SAR Campus Map [PDF].